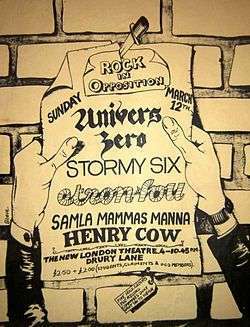 While "Rock in Opposition" was never intended to be a formal organisation, the festival did generate "a lot of press around the world". This prompted the five bands to discuss future plans and in December 1978 they met at Sunrise Studio in Kirchberg, Switzerland to reconstitute Rock in Opposition as a collective. By this time Henry Cow no longer existed as a group, but as RIO's prime mover its former members still actively participated. 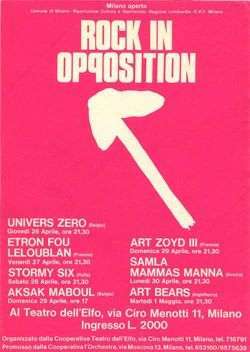 A second RIO festival, organised by Stormy Six, took place between 26 April and 1 May 1979 at al Teatro dell'Elfo in Milan, Italy where all seven groups performed, the original four (minus Henry Cow) plus the three new groups. During the festival, the RIO members met formally again to discuss the way forward. However, despite some constructive discussion, disagreements arose between the groups regarding RIO's role and matters were left unresolved. Two further RIO festivals took place in Sweden and Belgium, but no new meetings, and by the end of 1979, RIO as an organisation had "quietly slipped away". Poster for the 2nd RIO festival in Milan, Italy, between 26 April and 1 May 1979. Towards the end of 1978, Chris Cutler from Henry Cow and Art Bears and one of the active participants in RIO, had established Recommended Records (RēR), an independent record label and distribution network for RIO and similar artists. When RIO folded as an organisation, RēR continued RIO's work by representing and promoting marginalised musicians and groups. RēR became a "virtual" RIO, and "... is part of the continuing legacy of RIO". When RIO ceased being an organisation its name moved into the public domain where it took on the meaning of a music genre. While the term "RIO" was never used to refer to a particular style of music during the organisation's existence (the original RIO bands were quite diverse musically), it became used by listeners, musicians, and distributors as a means of classifying a particular subset of avant-garde artists – generally bands that appeared at the RIO festivals, or bands related to or derived from the original RIO bands, and artists who showed a distinct musical influence from one or more of the original RIO bands and their spin-offs. Avant-prog (short for avant-garde progressive rock) is a style that appeared in the late 1970s as the extension of two separate prog rock sub-styles: RIO and the Canterbury scene. A "reunion" festival took place at the Maison de la Musique de Cap Découverte in Carmaux, France in April 2007. The spirit of the original festival was preserved in that only artists of quality, innovation and the willingness to be "in opposition" to the commercial music industry performed. The festival was organised by French music promoter Michel Besset and Roger Trigaux of Present, who received Chris Cutler's sanction to use the name "Rock in Opposition". The line-up at this event included: Magma, Faust, the Peter Blegvad Trio (including Chris Cutler), Present, Zao, Mats/Morgan, Guapo, NeBeLNeST, Salle Gaveau and GMEA. A second edition of the France RIO event took place in September 2009 at the same venue as the first, and with the following line-up: Yolk, Aranis, The Muffins, Charles Hayward, Kōenji Hyakkei, Present, Magma, Univers Zero, Combat Astronomy, Electric Epic, Guapo and GMEA. The third "reunion" festival also took place at the same venue in September 2010, and featured Art Bears Songbook (UK, USA), Gong (France, UK), Caspar Brötzmann Massaker (Germany), Sleepytime Gorilla Museum (USA), Rational Diet (Belarus), Jannick Top/Infernal Machina (France), Thierry Zaboitzeff (ex Art Zoyd) "Cross the Bridge" (France, Austria), Full Blast (Germany, Switzerland), Miriodor (Canada), Genevieve Foccroulle (Belgique) and Aquaserge (France). The fourth edition of the France RIO also took place in September 2011, with a line-up of: Arno, Univers Zero + Present + Aranis ("Once Upon a Time in Belgium"), Alamaailman Vasarat, Vialka, Yugen, Gargantua, Panzerballett, Jack Dupon, Grumpf Quartet, Sax Ruins vs. Ruins Alone vs. Ono Ryoko, and Dispositivoperilanciobliquodiunasferetta. The 2011 event was covered in the 2012 documentary film Romantic Warriors II: A Progressive Music Saga About Rock in Opposition by Adele Schmidt and José Zegarra Holder. Two RIO festivals took place in 2014, the seventh French event in Carmaux in September, and a Japanese edition of the festival in Tokyo in November. The line-up for the Japanese event was: Aranis (Belgium), The Artaud Beats (UK), Happy Family (Japan), Kouenji Hyakkei (Japan), Mats/Morgan Band (Sweden), Picchio dal Pozzo (Italy), Richard Pinhas (France), Present (Belgium), Le Silo (Japan), SOLA / Lars Holmer's Global Home Project (Sweden/Japan). Cutler, who features in The Artaud Beats, said of RIO Japan: "[RIO] is changed of course; back then it was a musician-led exercise in self-sufficiency fighting for new musical forms and independence from the institutions; now it is recast as a celebration of those times and those bands, and of the music they inspired. [...] Which, I suppose, is the way it should be. RIO ceased to be ours long ago; now it's yours. Take care with it." Romantic Warriors II: A Progressive Music Saga About Rock in Opposition (2012) – a 98-minute documentary by Adele Schmidt and José Zegarra Holder. ↑ The text of the ticket below the flyer varies depending on source of the picture. On the Stormy Six homepage it clearly says "FIVE ROCK GROUPS THE RECORD COMPANIES DON'T WANT YOU TO HEAR. ", whereas at SquidCo the ticket is not legible and a bubble (incorrectly?) says "THE ROCK SHOWS THE RECORD COMPANIES DON'T WANT YOU TO HEAR." ↑ Zampino, Phil. "Rock in Opposition". SquidCo. Retrieved 12 September 2007. 1 2 3 Cutler, Chris. "Rock in Opposition". Chris Cutler homepage. Retrieved 31 August 2007. ↑ Cutler, Chris (1984). "Necessity and Choice in Musical Forms, Part III, Rock in Opposition". File Under Popular: Theoretical and Critical Writings on Music. London: November Books. ISBN 0-946423-01-6. ↑ "Pop/Rock » Art-Rock/Experimental » Avant-Prog". AllMusic. 1 2 "Rock in Opposition Festival 2009". Cuneiform Records. Retrieved 1 August 2013. ↑ "Interview with Roger Trigaux". Romantic Warriors II: Special Features DVD. Washington, D.C.: Zeitgeist Media (2013). ↑ "Rock In Opposition France Event – April 13th, 14th & 15th 2007". Rock Time. Archived from the original on 12 December 2007. Retrieved 7 March 2010. ↑ "Rock In Opposition 2010 – France Event". Progression Magazine. Retrieved 1 August 2013. ↑ "Rock in Opposition Festival 2011". Avant Music News. Retrieved 1 August 2013. 1 2 Lynch, Dave. "Romantic Warriors II: A Progressive Music Saga About Rock in Opposition". AllMusic. Retrieved 14 December 2012. ↑ "Rock In Opposition – 19/20/21 Sept 2014". Rock Time. Archived from the original on 8 September 2014. Retrieved 8 September 2014. 1 2 "RIO Japan 2014". rockinopposition-japan.com. Archived from the original on 8 September 2014. Retrieved 14 August 2014. ↑ "Chris Cutler's Message". rockinopposition-japan.com. Archived from the original on 8 September 2014. Retrieved 14 August 2014. Cutler, Chris (1984). File Under Popular: Theoretical and Critical Writings on Music. November Books. ISBN 0-946423-01-6. Rock in Opposition. Phil Zampino at Squidco. Rock in Opposition. Chris Cutler homepage. Melody Maker review of the 1st RIO festival. Stormy Six homepage.